Recently Kathryn Joyce wrote a story for The American Prospect on the rise of the responsible homeschooling movement. I have never seen a piece on this movement spread as quickly as Joyce’s. It lit up Facebook and Twitter like a forest fire starving for oxygen. If you haven’t read it, you should do so. (You should also check out responses it inspired from Hännah Ettinger, Chris Jeub, and Kate Schell.) Don’t let the length scare you away. The piece is amazingly detailed, giving voice to a diversity of individuals previously not amplified in this conversation. And don’t let the name, “Homeschool Apostates,” cause you to hesitate. The name is an inversion of Kevin Swanson’s radio broadcast where he himself used the phrase to marginalize and dismiss us. I shy away from Facebook wall debates when stories like this are shared by my friends. I watch them unfold, silently and from a distance. At the very least, I want to understand how our rhetoric is received and interpreted; I may not comment, but I am listening. I want to know what is being said — both positive and negative — so I can continue to improve my own communication and our shared messages. One individual’s comment on a friend’s wall stuck with me. As long as millions of families homeschool, it will always be possible to find some who are outliers and thereby call into question the practice. Tis a common practice of the statistically challenged. Pointing out that nearly all homeschool research has involved self-selective surveys that describe the participants but prove nothing about homeschooling in general. Providing counter-self-selective surveys, like the 2013 HA Basic Survey which pretty much “proves” as much as most of Brian Ray’s research — namely, still nothing about homeschooling in general. If you think the statistical side is lacking, you’re welcome to get in line. We’re right there with you. Those of us speaking up aren’t to blame for a lack of statistics. That’s the fault of irresponsible homeschool advocates. For today, however, we are all in the same position: we are feeling around in the dark with anecdotes and stories. You might tell different anecdotes and stories than I might. I choose to respect your storytelling. Whether you choose to respect mine is not in my control. But at least remember that I have stories. 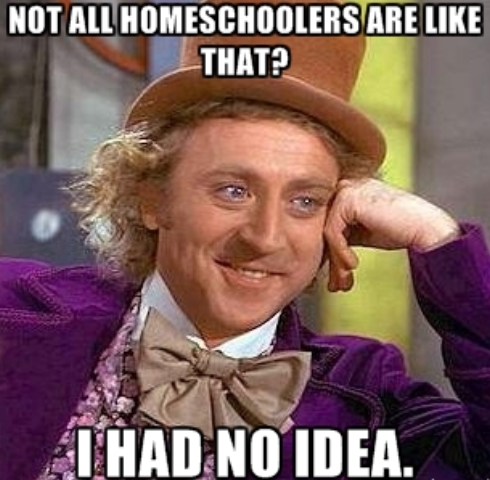 In fact, I probably have more than most homeschool students and parents. I spent a decade of my life traveling around the United States because of homeschool speech and debate — meeting new people, making friends, competing in tournaments, and teaching thousands of homeschool teenagers. I have taught the children of national homeschool leaders. All this while I was a teenager myself. As a homeschooled teenager, I saw things that you parents have not seen in your own communities. I have lived a life that you parents have never lived. It is like an alternate universe. My first taste of hard alcohol was provided by the son of one of the most prominent national homeschool leaders. I have lived this life. So while I don’t have statistics for you, and while we in this movement are trying to fix that inherited problem, keep in mind that my “anecdotes” — and our stories — carry the enormous weight of experience. Have you seen the underside of this world? Because I have. The rabbit hole goes down deep, and I have yet to reach the bottom. There are so many hurting kids, now as there was back when I was a kid. There are secrets and sorrows and fears. We have shared those secrets as friends, we have carried each other’s sorrows, we have whispered our fears like prayers. But maybe you’re right. Maybe at the end of the day, we’re in the minority. Maybe we are statistically challenged. The possibility doesn’t faze me one bit. Because I don’t look to you for a stamp of statistical approval. I don’t take my cues from your homeschool orthodoxies or your convention speakers. I take my cues from my conscience. And my conscience says go to where the shadows lurk, to create safe places even where the wild things are. See, a long time ago, I heard a story. It was about a shepherd who had a flock of 100 sheep. One day, one of those sheep got lost. Instead of remaining with the 99, the shepherd did not sleep, did not stop, until he found that the lost one. I learned social justice from that story. I learned the meaning of activism. I found the meaning of revolution — that you can “change the world” all you want, you can “redeem the times” ad nauseum. But if you neglect the little ones, it’s all for naught. See, I learned that Jesus of Nazareth was not content with 99 sheep when 99 sheep means that one gets left behind to suffer in silence and solitude. But Jesus dealt with human beings, not statistics. Human beings are what I want to deal with, too. So go ahead. Keep surveying your 99 award-winning sheep. Us “bitter apostates” will be out in the wilderness, searching for the one you abandoned. a beautiful response to the detractors of the Homeschoolers Anonymous movement, who say there really isn’t much of a problem, and who call for statistics. Exactly. I wrote about this today too. All along we were a bunch of individuals hidden under a narrative that made us look whole. What Kathryn wrote about is nothing new. We always were a bunch of pieces. The difference is now we are being heard. This is such a wonderful and beautiful statement of who and what we are. Thank you! I think I was the one engaging with that comment on Chris’ blog..I literally gasped when I read what that man wrote. It was so callous; I knew how an AA in the South must have felt not too long ago when addressing their atrocities. I want you to know there are healthy parents/advocates behind you guys…longing to help. I have boycotted conventions for nearly a decade. I have confronted my friends who are abusers. You aren’t alone. We’re just now learning how to help. I also do not like the argument that “abuse is hard to define and is subjective so people who are innocent might get accused.” In our personal lives, we haven’t run into any people from happy, healthy backgrounds who claimed they were abused just because they thought that would be a fun idea. I am well aware of the shame and “betrayal” associated with finding your voice. I’d rather take people’s word for it and move on from there. As a homeschool mom, I am willing to have kids live with us and undergo greater scrutiny for the sake of protecting others. I also will join my voice with yours to cry out on behalf of those who are too young or frightened or oppressed to be heard. Thank you for informing, for caring and for searching. God bless you. incredible. thank you for addressing this sensitive issue. “I honestly agree that moderation is key in how we personally approach homeschooling. I loved being homeschooled and will seriously consider it for my own kids one day. With that said, we do not base our laws on presumptions about average/normal behavior. Laws are always geared toward the deviant behavior. We don’t assume since only the “crazies” kill people, we don’t need laws against murder. It’s great that none of us commenting here [in the fb conversation] had negative or abusive experiences with homeschooling, and so I believe it’s important we give all children a chance to have that same experience. The extent that many homeschoolers go to prevent even the slightest bit of oversight (that would be harmless to non-abusive families) is uncalled for. Child abuse grieves me deeply, more than allowing for anonymous tips to the CPS (among other policies). Frankly, by suggesting that since most homeschoolers are not abusive there is no need for regulation, the commonly held belief [among conservative christians] in total depravity is undermined. I do believe in total depravity, which is partly why I think more regulation/statistics are needed. This is the best thing I have read in a long, long time. I know you will not love my comment. The problem of abuse in our country is so wide spread. You can hide it is homeschooling so well. You are so right. It needs to be exposed. But the problem is so much bigger then home schooling. I was never home schooled. I was kept out of school 1 day when my moms live in boy friend decided I needed to learn to tell time. He kept me home and taught me in a day. I digress. But I lived in abusive family for 18 years. And was in the public eye every day. I was taught to make up stories and say nothing. I actually didn’t know many things were wrong until I moved out to go to college. I think you should work hard in the corner of the world you know best. But I think you would be strengthened by looking at other communities of abused kids too. I also learned more from going to an Assemblies of God Bible college about the ways of the world from pastors kids then I ever learned in my upbringing completely outside the church. I don’t dislike your comment! I agree that advocacy should be intersectional. Our publishing work with HA and HARO obviously focuses on homeschool children, but my daily research focuses on all aspects of children’s rights and child abuse and neglect, whether it’s in public, private, or home schools. I think the United States has a long ways to go towards respecting children as valuable and autonomous human beings, and it would indeed be foolish to put blinders on and think the only problems are in homeschooling circles.